It took more than 10,000 tons of boulders and $738,000 of city funds, but a critical Paso Robles water wellfield is now purportedly safe from an eroding Salinas River bank. Paso officials said they recently completed work on the emergency Salinas River bank stabilization project, launched in June 2018. Heavy rains during March 2018 ripped 30 feet of sediment off an eroding section of the river wall, diverting the flow of water dangerously close to the city's adjacent Thunderbird Wellfield, which pumps half of the city's water supply. 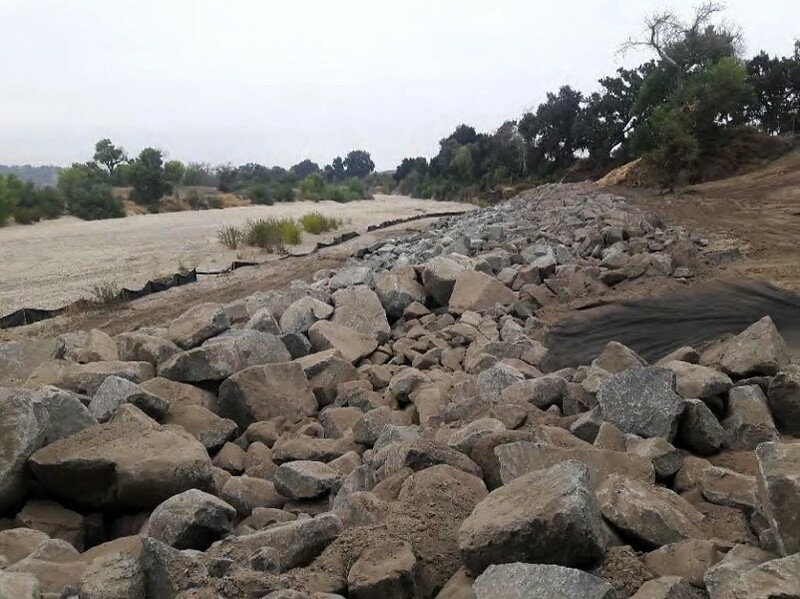 BOLSTERED More than 10,000 tons of granite was installed along a section of the Salinas River bank that was eroding and threatening a critical Paso Robles city wellfield. "One more rain and we lose a well," Paso Water Resources Manager Chris Alakel told New Times in June. The city obtained emergency permits from state and federal environmental agencies to shore up the bank, located near the Firestone Walker Brewery, with boulders. Alakel said the city contracted with a Tulare County-based quarry to produce and deliver the thousands of tons of granite rock. "The most difficult part was getting the material," he said. "There were often times we were waiting for material. It was a lot of rock to truck in." After the boulders were positioned, workers covered them with soil and loose straw and planted native seeds for trees and shrubbery to grow back, as required to mitigate environmental impacts. "What we're left with now is the environmental restoration, which will be ongoing for the next several years," Alakel said. Alakel's confident that the boulders will hold the bank strong for years to come and protect the city's wells. Paso ratepayers may have to pay extra for it, though. With $737,000 spent on the project thus far, out of reserve funds, city officials have indicated that higher water rates could be one consequence of the crisis.